This fine, bright Monday, we bring news of a very French bistro. It's a bistro's bistro, really. It's called Bistro Pierre Lapin, and it's open all day starting now in the West Village. Harold Moore of Harold's Meat + Three is behind this, but Pierre has much more in common with Commerce, Moore's previous ornate West Village ode to not dieting, European style. It's charming—almost too charming—with its rococo wallpaper and quaint booths and marble bar. That combined with the fact that it's an all-day spot make it good for a range of dating situations and floral Instagramming. For the first date, arrive early and peruse the Croque options (menu here). Consider the burger on toast, because it looks a lot like one that's going to appear on best-burger lists soon. Note with delight the table near you who ordered the Fricassee de Champignons with brioche and had their mushrooms flambeed right at their table. They must be on a more advanced date—one that can risk being near an open flame. The later it gets, the more likely you are to want enough chicken for two people. And that happens to be a specialty here, as they serve a whole roasted bird with foie gras bread stuffing and potato puree. 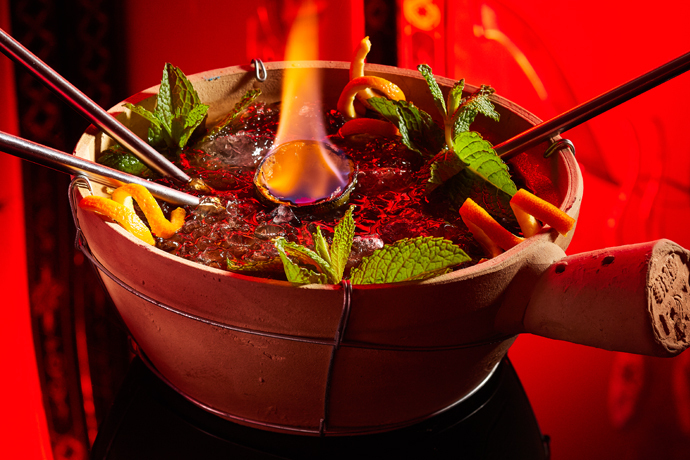 As far as the cocktails to imbibe with the chicken, they're focused on French liqueurs and the Margarita Française—white tequila, China-China, Calamansi juice—sounds pretty good for a balmy May evening.